Why Isn’t It A Good Idea In North Attleboro To Seed Lawns In The Spring? Many factors can contribute to the poor health of your lawn in North Attleboro. Disease, insect damage, excessive thatch, and hard-to-control weeds are just a few of the things that do damage to turf. 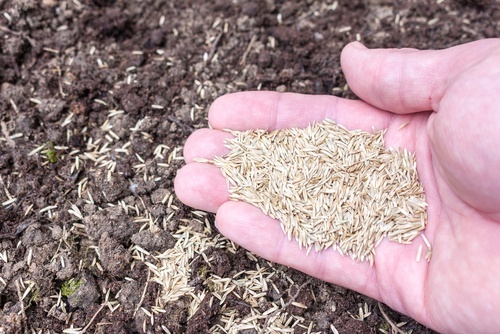 In the spring, you might be tempted to add seed to your lawn, but there are good reasons why waiting until late summer to seed lawn is better. Timing your lawn maintenance is important and over-seeding contributes to a healthy turf. Even healthy lawn practices such as watering, mowing, fertilizing and soil testing cannot prevent some damage. Renovating your lawn may be necessary due to the things that can damage your lawn mentioned above. You begin the process of renovation by eliminating the problems (treat disease, apply insecticides, de-thatch, and weed control.) The next thing you want to do is seed lawn without completely tilling it under. Depending on the damage, you can apply the seed to patches or kill all plants in the turf area with a non-selective herbicide, and then the entire area may be seeded. A good rule of thumb is to re-seed the entire lawn if 50 percent or more of your turf has been infested with weeds or undesirable species of grass. August 15 through September 15 (late summer) is the best time to get good results with re-seeding. Cooler temperatures, abundant rain, and less weed competition contributes to this ideal environment. Re-seeding in late summer gives the new plants that spring from the seeds enough time to become established before cooler weather sets in. Avoid trying to re-seed in the spring. Heat, weed competition, and dryer conditions will not lead to much success with growing new grass. If you have doubts about your ability to re-seed your turf, check with a landscape professional for help.